﻿ Sid signs for less, quality UK made speed indication devices. Speed indication devices made in the UK. 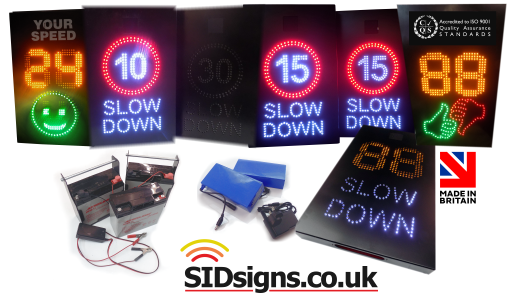 Sid signs are interactive led illuminated displays which react to traffic speed. Controlled by in built radar detection devices, each speed sign is able to detect the presence of oncoming vehicles and react to them. How your speed indication device reacts is something you can control. Want to reward drivers under your speed limit? Need to warn traffic moving to quickly? Depending on which type of sid sign you have there are settings which allow you to control at which speed certain parts of the sign turn on and off. 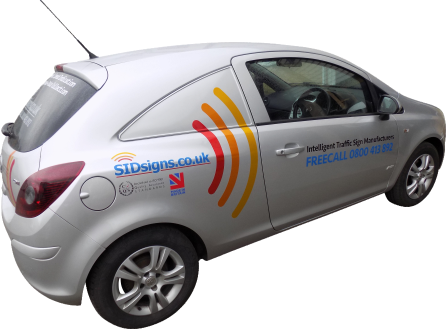 If you are shopping around for a sid sign or radar speed display you will inevitably question how we can deliver a quality sid system at prices which can be dramatically lower than the competition. To answer your question it's important to understand what real manufacturing means. This is the kind of sid sign manufacturing you get at sidsigns.co.uk. No subcontractors, no middle men, no outside help. When your speed display system is made a small team of specialists with all the right equipment does all of the work, even the user guide is printed in-house. Lots of sub contractors add lots of individual profit margins and layers of cost. Strip these out and sid signs suddenly become a lot more affordable. Used by serious organisations like the British Army and the Royal Air Force the sid sign products on this site are durable, professional grade pieces of kit. Don't be fooled by the price difference, you get a quality speed signage system, you just don't pay over the odds for it. Of course, if you want to spend a lot more on a piece of sign equipment which does the same thing there are other sites to choose from. Heath and safety; this is the closest category for sid displays and speed signs. A standard message design, a universal response to traffic speed, a uniform colour and shape. When you start to think about it a sid sign is little more than another type of safety sign; something you've got to have but not something you want to lavish huge amounts of money on. A utilitarian product which needs to do a standard job. If you are thinking along the same lines; "I just want a sid system that works, I'm not buying a luxury item", our sensible approach to sid sign costs is a perfect match. Our entire sid display product range has range has been completely rethought and redesigned. A brand new software based control system delivers a range of functions and features which simply weren't possible on earlier generations of sign. Auto detect USB drive technology as standard, the most affordable data collection system and a new digital control system means these are the best sid signs we've ever made. Before you commit to another sid brand get a price from us, you'll be glad you did.